Around thirty years ago I first visited the site of the former Cefn Cribbwr ironworks and brickworks in an attempt to interpret the visible remains. I didn’t revisit again until the mid 1990s by which time the site had been taken over by the local authority and had been ‘tarted up’. On this occasion I had visited to view the remains of the tramway which I told you about a week or so ago. 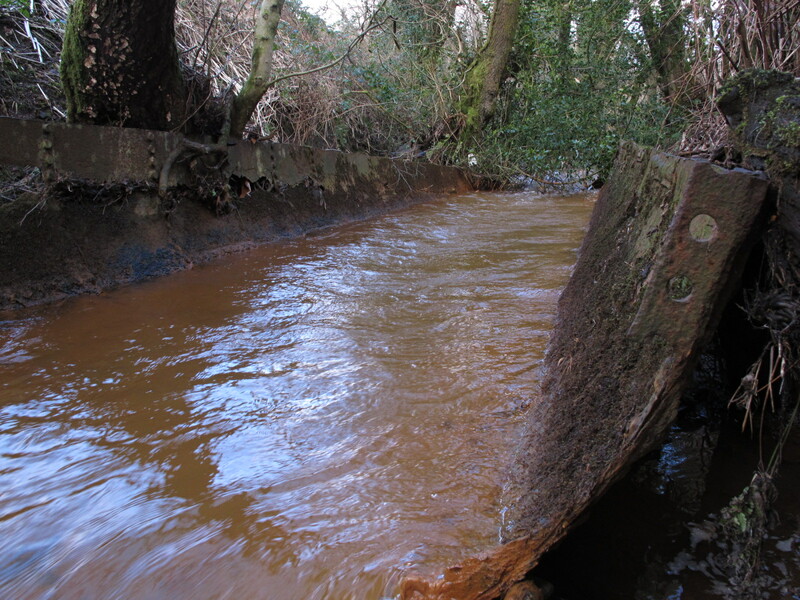 At the same time as visiting the tramway remains we also explored the river which runs alongside the ironworks looking for evidence of any leats or waterways which would have been constructed to channel water into the ironworks and came across a curious feature embedded in the river. At the time I assumed it was some form of channeling and duly photographed it without applying much thought as to what it may be. I came across the photograph a few days ago and was immediately re-curiositised, if there’s such a word! From the photo it looks like at one time it had been a cylindrical object which had been cut down its length and the two halves laid longitudinally in the stream. I posted the picture on the photo-sharing site flickr hoping someone would be able to identify its origins and before too long it was suggested it was a Lancashire boiler cut down lengthways. On researching Lancashire boilers it would seem this was a possibility but from my photographs I couldn’t see any of the longitudinal rivets holding the sections together, also, a Lancashire boiler may be too late a date for it to have been an artefact from the ironworks. As a result of further research I came across a description and photographs of a Cornish boiler, a single flue early version of which the Lancashire was a development and deduced a boiler of this type is more likely, given the fact we know a Bouton & Watt type steam engine was installed in 1824. Further identification from my eighteen-year-old photos though was difficult, there was nothing for it, I was going to have to revisit so one afternoon this week I set out to relocate this iron feature. 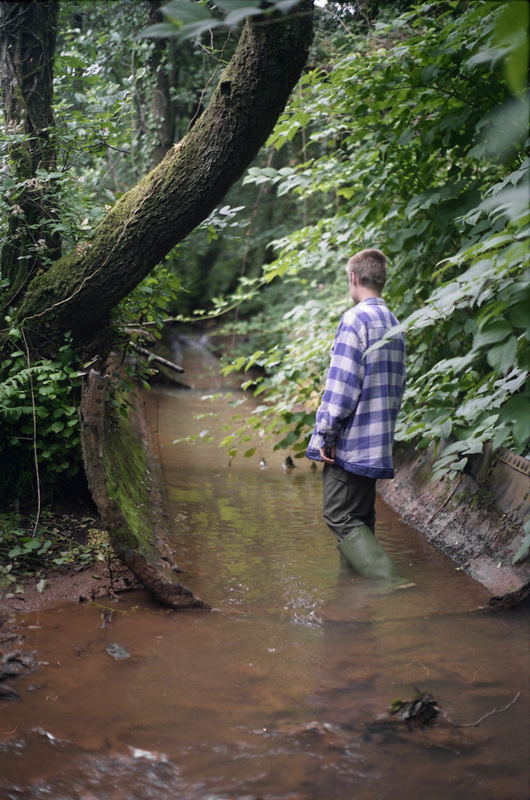 On arrival at the site I went to where I thought it was and found nothing so walked along the public footpath downstream a short way but still couldn’t find it. Walking back upstream was more difficult, the river level was too high to wade in so had to scramble along an overgrown bank on the north side until I spotted it, way down in a gully; not approachable from that side then? Approaching from the other side the longitudinal rivets were very much in evidence, but only one row, suggesting a very early boiler design, but I had to get in closer for a better inspection. A holly tree has recently fallen down over the centre of the two halves making it difficult to get from one end to the other but I took a few photographs and left, satisfied in my mind that this was indeed, probably the remains of an early Cornish boiler. There are a number of unanswered questions. 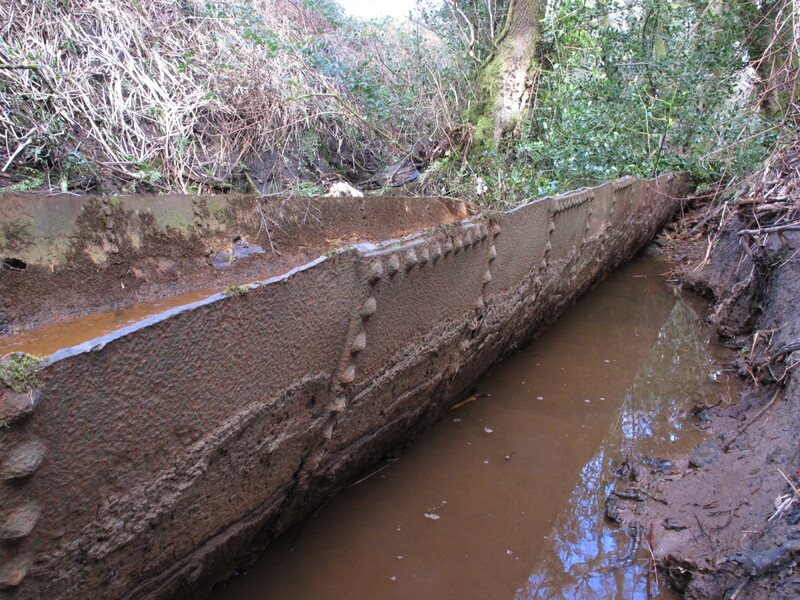 If this really was the original boiler for the 1824 engine, why was it cut in half to be placed in the river about one hundred metres away? How was it transported to the river, was it rolled and then cut in half once it was in the river? Most intriguingly, why is it in the river at all and what purpose was it intended to serve? Until I can locate any documentary evidence I guess these questions will remain unanswered. If this boiler is indeed the original one installed at the ironworks then its role in the history of the site should be recognised, ideally it would be nice if the boiler could be removed to the ironworks site and reconstructed in its original position, if that’s possible. If this really is the original, then that would make it the oldest such artefact in Wales, indeed probably one of the oldest surviving in the country. I feel it deserves recognition and relocating, but I know that would take a super-human effort and enormous expense and is therefore highly unlikely – one can dream though! Good story – I enjoyed it! I’ve always associated the tube with the boilers installed to the east of the furnace next to the engine house. 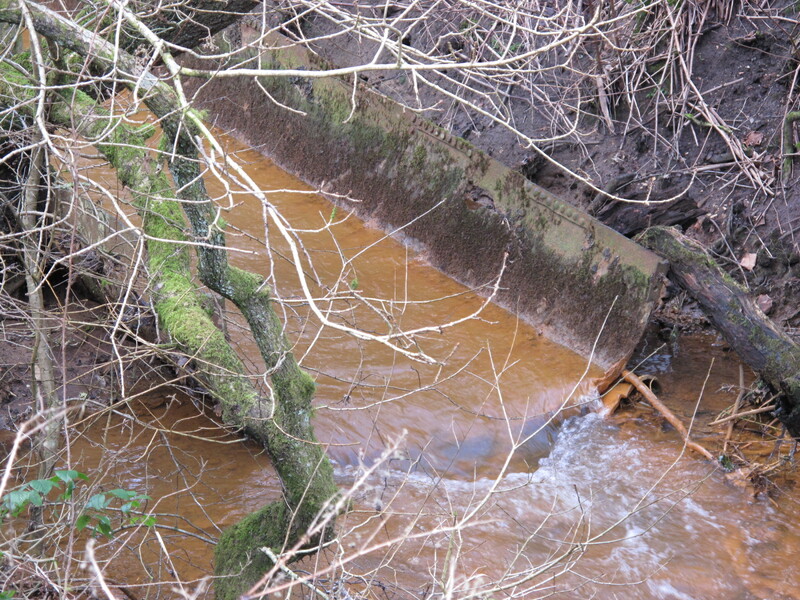 In the late 1830’s one of Cefn’s most important industrialists ,William Malins,sank the Cefn Cribwr drift [the old Cefn Slip] but water continually seeped into the workings. His solution? Re cycle the boilers in the now defunct ironworks. In an ideal world it would be good to get it back onto the engine house site John, it should possible to weld it back together, but can you imagine the cost and effort of moving it!